Surprise your friends when they don't expect it, by having St Roger Abbey Organic French Patisserie drop ship some of our Delicious Viennoiseries, so popular in Chicagoland and surrounding areas! These are the cream of French pastries - Made by French Sisters. Offer the Gift of Family Traditions. SHOP FOR A GOOD CAUSE TODAY!!! Our Authentic Viennoiseries are crafted in keeping with the Monastic Tradition, using select organic ingredients to freely allow a taste bouquet. Quality products for your good health. These Organic Viennoiseries, such as the Organic Croissant, the Organic French Chocolate Croissant and the Organic Plum Turnover are really among St Roger Abbey's best sellers, and they prove extremely popular for their incomparable taste, moist and freshness.Our Nuns bake their Organic Viennoiseries early morning to have them crisp, fresh and ready for their clients. A genuine delight and our visiting French friends congratulate us for their outstanding taste, much superior to the Viennoiseries that at times are made in France. 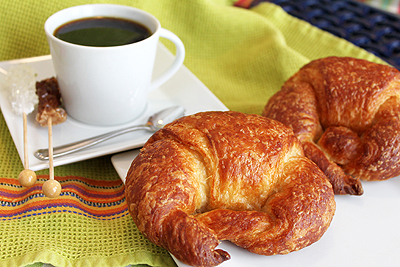 Quality is a priority at St Roger Abbey, and everything is done to maintain this very French Tradition to have, for breakfast (or even during the day), a delicious organic Croissant or French Chocolate Croissant, to be paired with a good Organic Coffee or Tea from St Roger Abbey. Breakfast should be an important and stimulating moment, to start the day off right; therefore, start it with the delicious St Roger Abbey Viennoiseries!